You are currently browsing the Bookmobile News weblog archives for March, 2013. After quite a bit of sleuthing around, we finally caught some luck with a kind lead from Patti England at Impact100 Sonoma, with whom we partner on our work in the Sonoma Valley area. She indicated that her son Jeff might be able to help and sure enough, he was happy to set up our latest book donation box at his 76 gas station at West Napa and 2nd Streets downtown. Located just one block west of the historic plaza, Sonoma 76 should be a convenient spot for residents to come donate the best of their collections! Due to space considerations, you may not see our usual donation box in the lobby but just let the attendant know you want to drop off books for the Free Bookmobile. They’ll keep them in the back storage room for us until we make the pick-up. The Sonoma site is our sixth location throughout the county, and the first to serve the southeast region. The other five can be viewed through the “Donate Books” link on our website. From the north, take Highway 12 south to West Napa Street, following it east into downtown. From the east or south, head toward the Sonoma Plaza and continue west another block on West Napa. Station is at SE corner of intersection with 2nd Street. The Free Bookmobile has always benefited greatly from the contributions of folks who believe in our mission. Ron Hass contacted us after seeing our request in the Press Democrat for help with sorting book donations, so it’s fitting that he should be the subject of a volunteer profile in that same newspaper after two years of amazing service! Chocolate and Cinema – the yummiest night of the year! It was a chance for us to meet up with friends both new and old, show off the bookmobile’s new paint, and celebrate literacy services in Sonoma County. 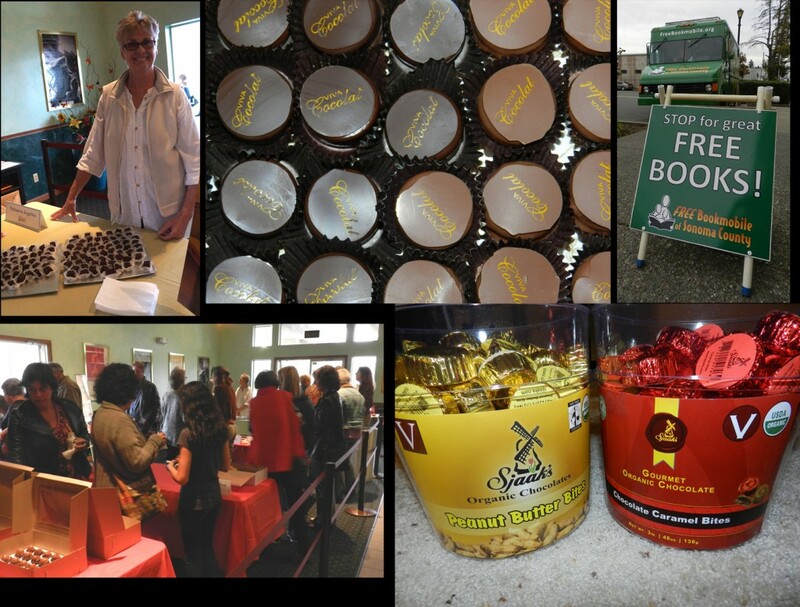 The star of the show was undoubtedly the marvelous chocolate, offered in abundance by the area’s best: Patisserie Angelica, Moustache Baked Goods, Sjaak’s Organic, Viva Cocolat, Divine Delights, Downtown Bakery & Creamery (Healdsburg), Bianchi’s Bake Shop, J.M. Rosen’s, Sonoma Chocolatiers, Oliver’s Market and Whole Foods of Sebastopol. Huge thanks for these generous donations! Photos of the event can be seen on our Facebook page by clicking here. We are also very grateful to our host on the evening, Ky Boyd of Rialto Cinemas, and to our fundraising partner, the Sonoma County Public Library Foundation. And we couldn’t have brought everyone together without the tireless efforts of Literary Arts Guild board member Stacy Ruppert. Stacy is featured in previous bookmobile news posts posing with the thousands of children’s books she brought in over the past two summers. Now we know she can throw a great literacy party…so what’s next? Stay tuned to find out! The Big Read is on! For the month of March, the Free Bookmobile is proud to once again partner with KRCB Public Media to promote awareness of the poetry of Emily Dickinson. There are many educational and celebratory events happening throughout the month, which you can read about on KRCB’s Big Read website page and on their Facebook page. The National Endowment for the Arts has some terrific background information on Dickinson’s work, which you can access by clicking here. We will have books of her prose available free to patrons (while supplies last), including reader’s guides and children’s books about her life. We also have a selection of five different Poems in My Pocket you can take with you. Come see us in March and learn more about an American legend!